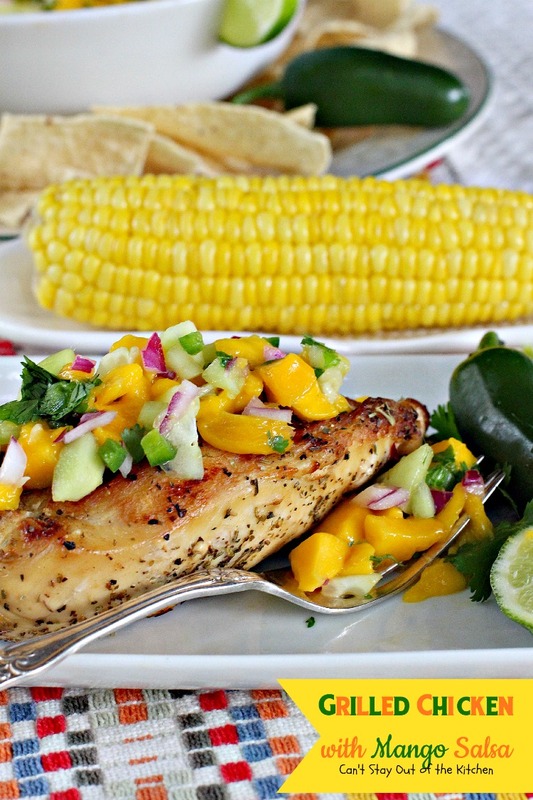 Grilled Chicken with Mango Salsa is one of my favorite summer recipes. 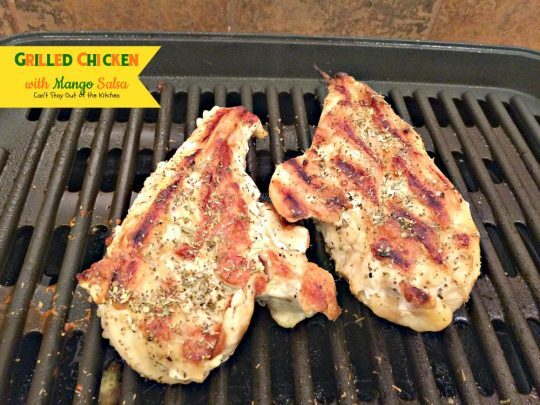 The chicken is seasoned very simply and grilled. 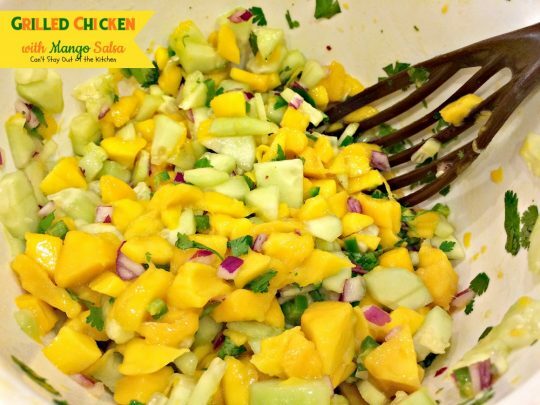 Then it’s topped with a scrumptious Mango Salsa that’s got crunch from the cucumbers, heat from the jalapeno peppers and red onions, sweet from the mangos, savory from the cilantro and citrusy from the fresh lime juice. 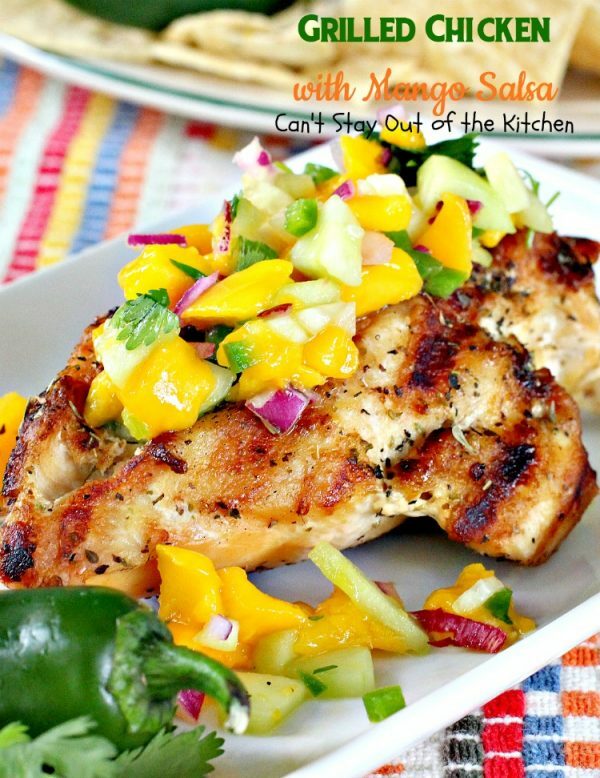 All the flavors work so well together and when the Mango Salsa is served over top of grilled chicken, pork chops or steaks it is quite wonderful indeed. 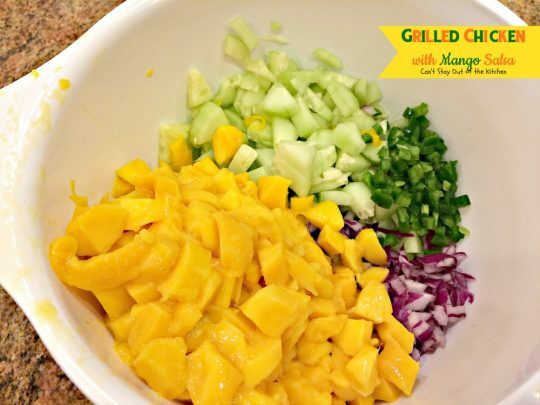 Last summer a friend of mine made this Mango Salsa recipe several times when we were serving food during a mission trip. I loved it at first bite. I got the recipe from my friend’s daughter, but then promptly forgot about it until I saw some mangos in the store last week and realized I wanted to make up a batch of her Mango Salsa. When Cyndie gave me her daughter Bryce’s recipe, she said they really liked eating the Mango Salsa with Grilled or Barbecued Chicken, Steak or Pork Chops. It’s also good with fish! If you’re looking for a great, fun, summer time entree to serve to friends and family, you will really enjoy this Tex-Mex entree. 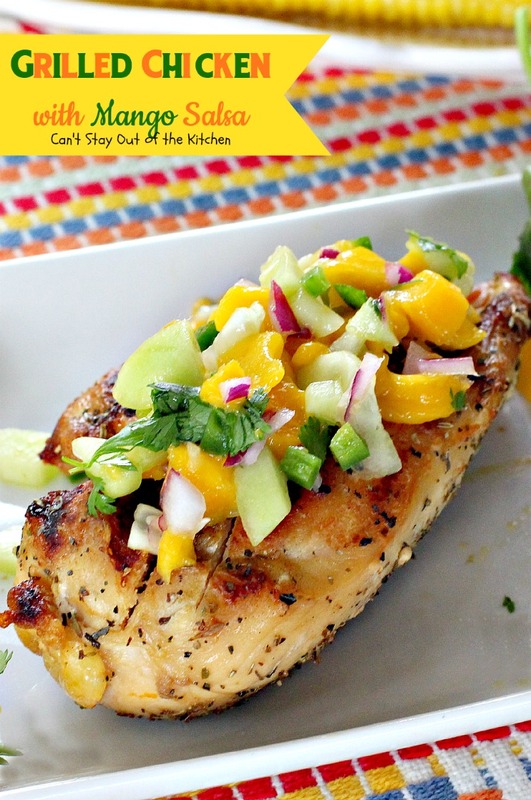 Grilled Chicken with Mango Salsa is healthy, low calorie, clean eating and gluten free, as well. This recipe doesn’t take more than about 30 minutes from start to finish if your grill is hot. Quick, easy, succulent, delectable. Yes! 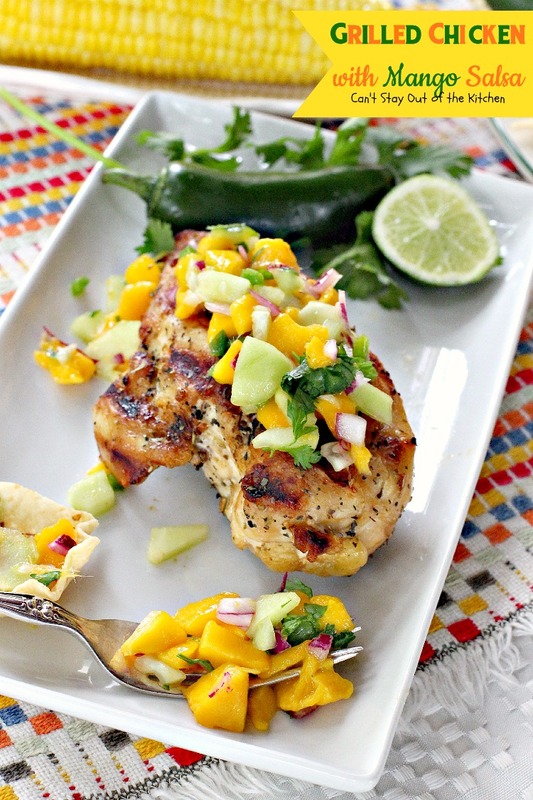 Grilled Chicken with Mango Salsa is tasty and mouthwatering. Grilled Chicken with Mango Salsa is a refreshing summer entree that’s made on the grill so you can keep your house cool! We served this delectable chicken entree with corn on the cob. Sprinkle both sides of chicken with Italian seasoning. Grill on each side about 10-15 minutes. Turn chicken over and grill until done. Meanwhile, make Mango Salsa. Place diced mangos, cucumber, red onion and jalepeno peppers in a mixing bowl. Add chopped cilantro and fresh lime juice. Stir to combine. Set aside until chicken is cooked through. 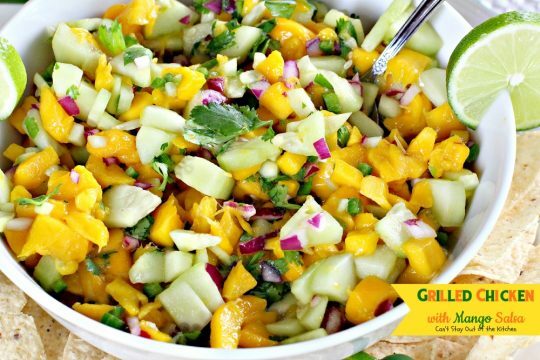 Garnish Mango Salsa with fresh lime juice and more chopped cilantro, if desired. 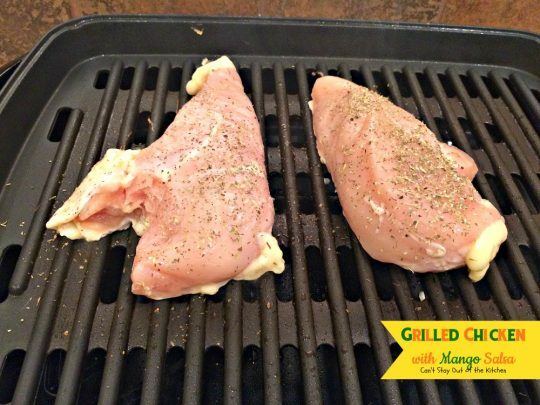 Place grilled chicken on your plate. Top with as much Mango Salsa as desired. Refreshing summer chicken entree with a delicious Mango Salsa that's made with mangos, cucumber, jalapeno pepper, lime and cilantro. Gluten free. Spray a grill (before heating) with cooking spray. Sprinkle both sides of each chicken breast generously with Italian seasoning. Cook chicken on grill about 10-15 minutes each side or until cooked through. Meanwhile, peel and dice mangos and cucumber, add to a small mixing bowl. Add finely diced red onion and seeded, finely diced jalapeno pepper. Add cilantro and lime juice. 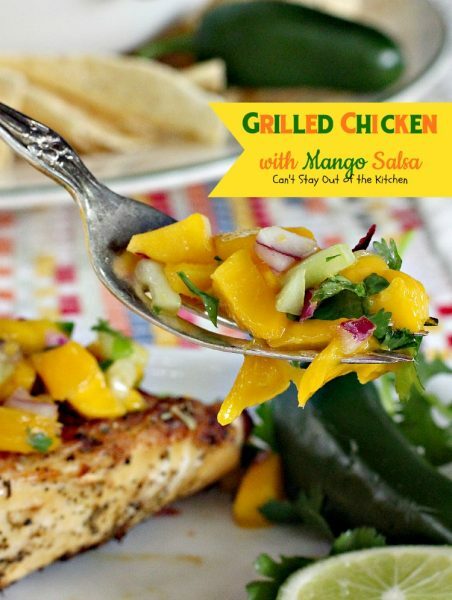 To serve, ladle Mango Salsa over grilled chicken breasts. 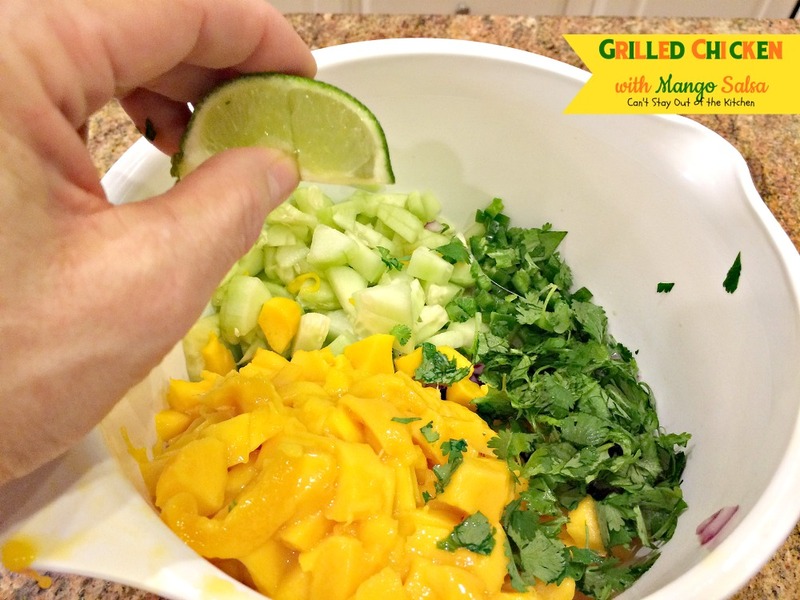 Serve extra Mango Salsa with tortilla chips, if desired. 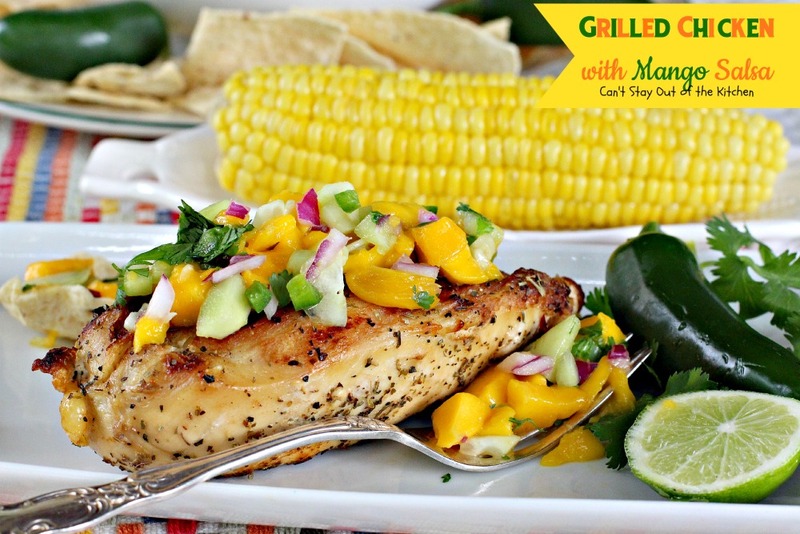 Refreshing summer chicken entree with a delicious Mango Salsa that’s made with mangos, cucumber, jalapeno pepper, lime and cilantro. Gluten free. Serve Grilled Chicken with Mango Salsa with your favorite side or salad. Every forkful of Grilled Chicken with Mango Salsa was amazing. This looks wonderful! 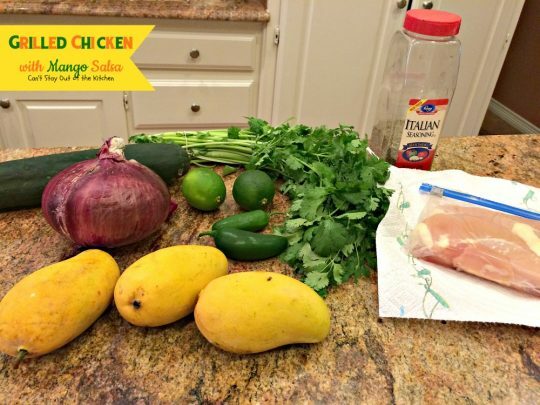 The mango salsa is such a beautiful color, and I bet tastes great with the chicken. What a perfect summer meal! It was really wonderful, Shari, and the salsa will work on steak, pork chops or fish as well. Yum. Okay, I know what’s going on my grocery list. Looks super yum, Teresa! Thanks, Tamara. It is super yum! Quick and easy, too.